RALEIGH – The No Tolls I-95 Coalition, a grassroots organization opposed to recent proposals to place tolls on Interstate 95 (I-95), commends the North Carolina House of Representatives Transportation Committee for passing legislation that limits the North Carolina Department of Transportation’s (NCDOT) authority to toll I-95 in North Carolina. Members on both sides of the aisle unanimously approved HB 267, which requires the NCDOT to provide the same number of toll-free general purpose lanes that existed prior to any implementation of tolls. This effectively allows the NCDOT to toll new lanes or HOV lanes (for vehicles not meeting the occupancy requirement), but prohibits tolls on existing general- purpose lanes. The bill is sponsored by Representatives Collins (R), Torbett (R), Floyd (D) and Wray (D) and has bipartisan support. “I am glad to see that the General Assembly has put conditions on NCDOT’s tolling authority. We look forward to working with the bi-partisan group of legislators that have co-sponsored this important legislation and encourage the rest of the General Assembly to support it,” said Ernie Brame, Chairman of the No Tolls I-95 Coalition and General Manager of Kenly 95 PETRO. A full vote by the House of Representatives on HB 267 is expected prior to Crossover on May 16. If it passes the House of Representatives, the bill then goes to the Senate for approval. Tolls would cause major diversion of traffic onto local roads, thus increasing congestion and safety risks in local communities and on secondary roads. Tolls would negatively impact economic development, cost jobs and hurt existing businesses along the I-95 corridor. Toll collection would waste millions of taxpayer dollars on constructing and operating the toll plazas instead of funding road improvements. Tolling I-95 is a “first step” and would set a dangerous precedent to toll additional existing interstates, including I-40 and I-70. “Tolls can affect every aspect of our communities from business and tourism to public safety. Legislators are clearly aware of the implications that tolling will have on individuals throughout North Carolina and I am glad to see that they are moving forward with this important piece of legislation,” said Lori Medlin, President and CEO of the Halifax County Convention and Visitors Bureau. “As someone who oversees a management company with hotels throughout North Carolina, I know that tolling I-95 will have a tremendous impact on tourism and all related services that travelers spend dollars on during their stay. I-95 is the primary transportation artery not only for North Carolina destinations but also for overnight stays and travelers will divert to other roads to avoid tolls. This will have a significant negative impact for many counties and businesses in the state that depend on tourism for their livelihood as well as make us far less competitive with other states,” said Jerry Dimeo, President of First Carolina Management. NCDOT’s plan to toll I-95 has caused a swell of opposition. Over 5,300 individuals have signed an online petition in opposition to tolling I-95 as a means of raising revenue for transportation. 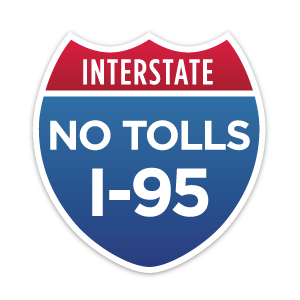 To date, 20 local governments have joined numerous businesses, economic development and planning organizations in passing resolutions in opposition to tolls on I-95. The coalition continues to grow as residents become aware of the negative impact of tolling I-95. “This is an issue that affects residents throughout North Carolina, not just those in the Eastern portion of the state. It will negatively affect our state’s business-friendly reputation and cost jobs. The General Assembly needs to pass this legislation now before many more communities are confronted with the same threat that Eastern North Carolina is now facing,” said Tony Brown, Halifax County Manager. Say NO To Tolls on I-95! Sign the petition to keep tolls off I-95 in North Carolina. Not from NC? Select "out of state."